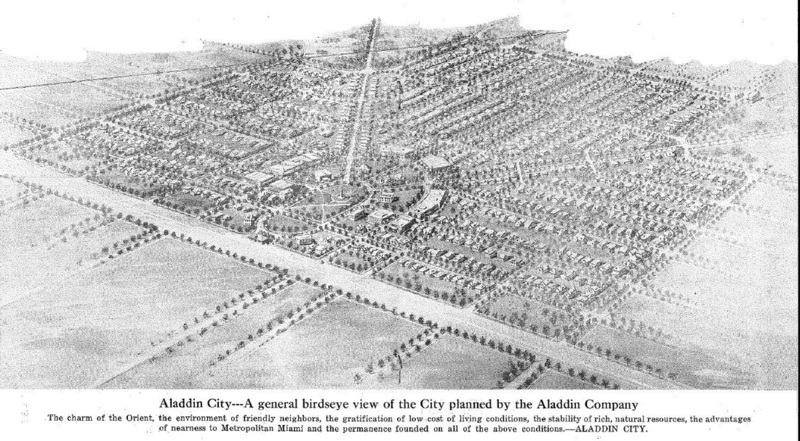 At the end of 1925, The Aladdin Company of Bay City. Michigan purchased a large area of land in the Redland agricultural area of South Florida. The company, who competed with Sears in the mail-order house kits business, had planned a Moorish-themed city, boasting that the home could be built from “dawn-to-dusk”. 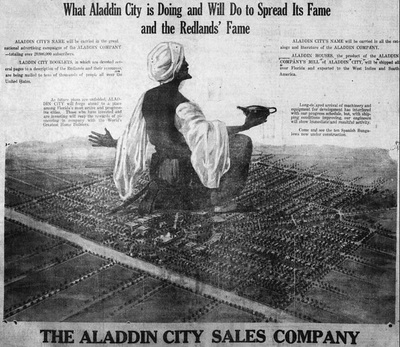 The community was supposed to house 10,000 people, and the sales brochure announced: "Because the inspiration for its name is derived from the wonderful Oriental story of Aladdin and because location surroundings, climate, and vegetation so peculiarly fit it, the Persian style has been selected for the motif of Aladdin City." 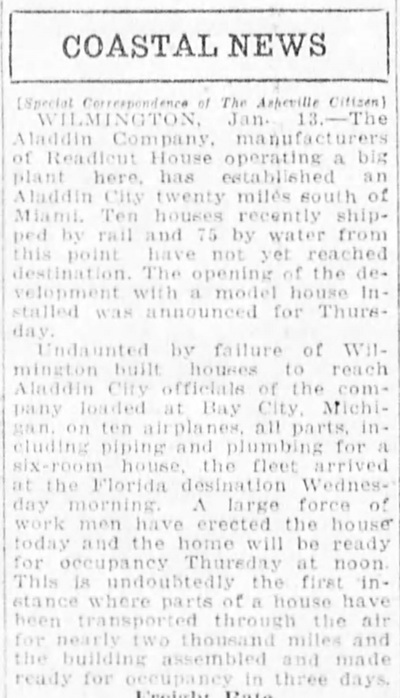 On January 14th, 1926 the company flew all the materials from Fort Lauderdale, and the local newspaper reported on how hundreds of spectators came to see a crew of builders that included carpenters, electricians, plumbers and cement workers construct a house. 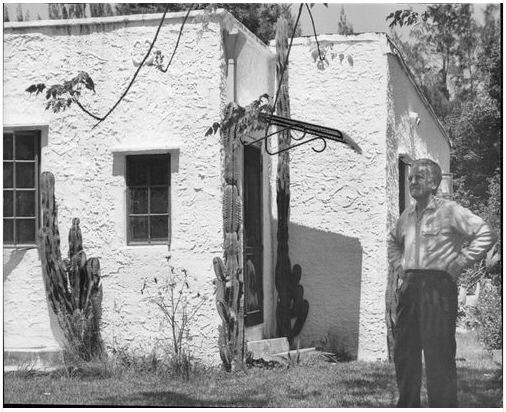 As promised by the Sovereign brothers who owned the company, the house was finished by nightfall including the electrical and plumbing as well as the sidewalk and landscaping. This example paid dividends for the company when 874 home sites were sold on the opening day according to an advertisement appearing in the Miami News a few days later. 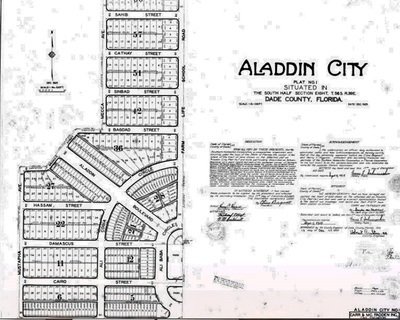 The Aladdin Company already had five plants in the United States and Canada operating to produce other versions of “kit” homes, with plans to build a sixth one in Aladdin City. 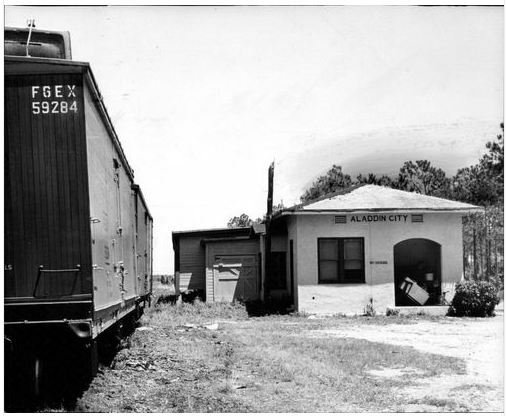 They were planning to use a new extension being built by the Seaboard Air Line Railway to connect Central Florida to Homestead to transport materials to the plant. This plant would also be used to send materials to the West Indies and South America. 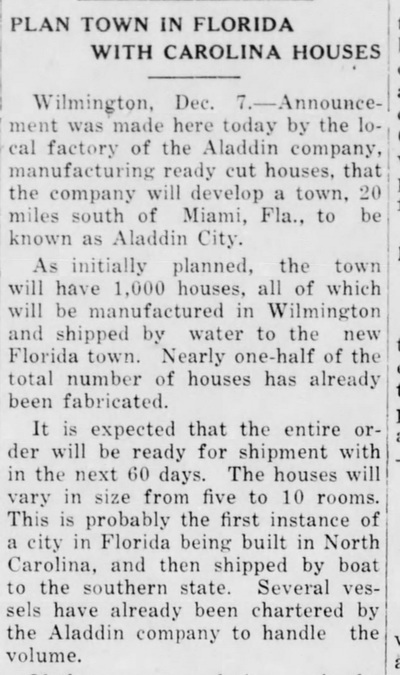 Unknown to the company the end of the Florida Land Boom was on the horizon, and despite the brisk sales they ran into problem with bringing in the materials to build the homes. On October 31st, 1925, an embargo was passed in which only foodstuffs, fertilizers and other essential commodities were allowed into Florida. This was passed in order to address a glut of building materials which had been shipped to Florida before they were ready to be used, and stood on railcars tying up the railroad lines. The embargo was lifted in May 1926, however this along with the sinking of the Prinz Valdemar in the Miami Harbor which occurred in January 1926 blocking access to the sea, interrupted the flow of materials which the company had expected to be in place when they launched the community. 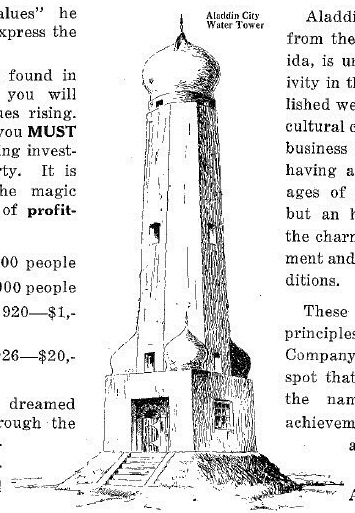 ​On March 14th, 1926 a ceremony was held by the company in which a cornerstone was laid down at the corner of Ali Baba Circle and West Cairo Street, which was slated to be a one-story bank building. Throughout the spring of 1926 the company continued advertising for homes, apartments and business sites touting that with a $250 down payment, a buyer would be able to buy the home site (total cost $1000) and Aladdin would "aid you in planning your home, build it for you, and help you finance the entire transaction...."
The Florida real estate business which already showed signs of slowing down, suffered another setback when the 1926 Miami Hurricane made landfall, hurting prices even further. The Aladdin Company had already built a number of homes, a town hall and the train station to receive materials for the Seaboard railroad extension, however building efforts slowed down significantly. The advent of the Great Depression in December 1930 stifled sales even further, despite efforts of the company in giving away two homes in a nationwide raffle. In March 1934 the plans were revised and the remaining home lots returned to acreage. In November 1936 the company had dissolved after liquidating their land holdings. The streets were laid, sidewalks built, city hall built and street lamps installed. The company had built a total of 8 to 12 homes; however by the time Hurricane Andrew blew into Homestead in August 1992, the remaining homes and the wooden train stations were damaged and subsequently torn down. 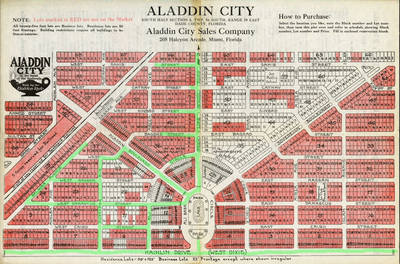 “The original community was centered on a large oval—known as Ali Baba Circle—oriented on a north-south axis. The interior of the oval was planned as Ali Baba Park, with a large bathing pool in the middle. The top half of an even larger oval, Ali Cogia Circle, surrounded Ali Baba Circle. Both circles were planned as the site of the city's commercial district. 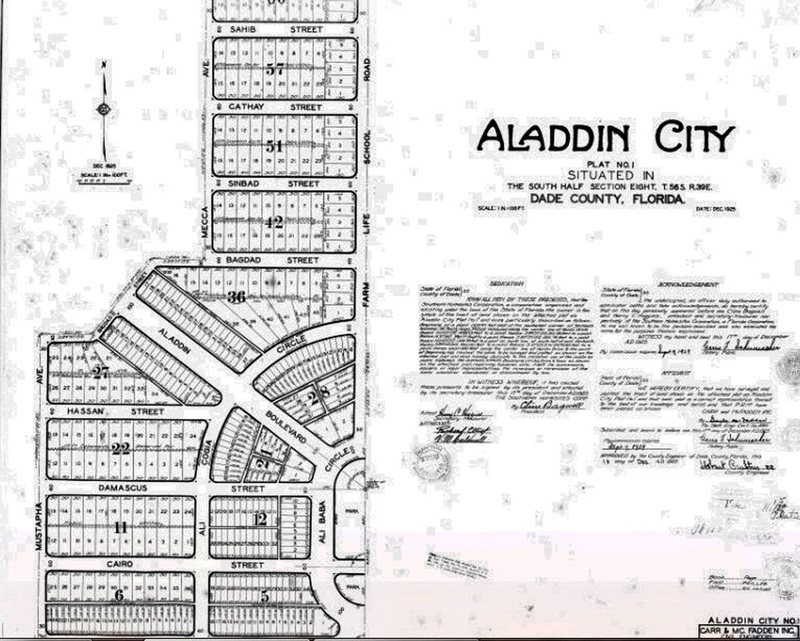 The southern tip of Ali Baba Circle led onto Hainlin Mill Drive, while Farm Life School Road (SW 162nd Avenue) extended from the northern tip and also continued south from the intersection of Ali Baba Circle and Hainlin Mill Drive". 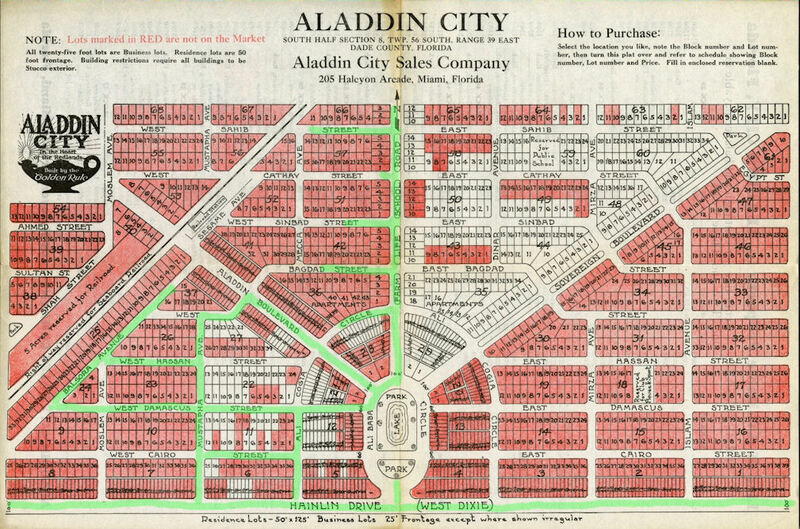 "Two hundred-foot-wide boulevards, Sovereign Boulevard (the only street without a Moorish name) and Aladdin Boulevard, radiated from the northeastern and northwestern curves of Ali Baba Circle. Damascus Street and Cairo Street extended from the east and west sides of the circle, with Cairo Street bisecting Ali Baba Circle south of the bathing pool site. Hassan Street extended west from the intersection of Aladdin Boulevard and Ali Cogia Circle West and east from the intersection of Sovereign Boulevard and Ali Cogia Circle East. 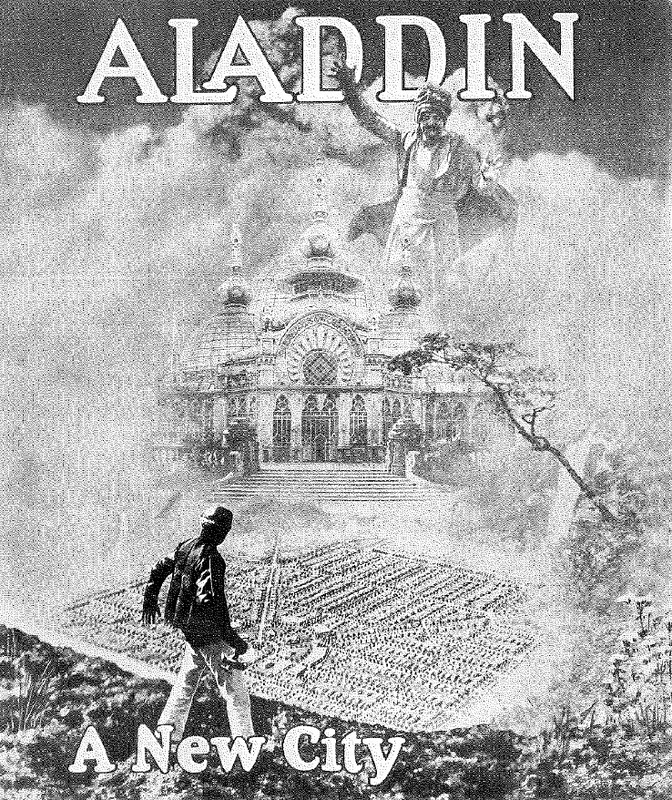 Running in a north-south direction west of Ali Cogia Circle was Mustapha Avenue, which ended at Aladdin Boulevard. North of Ali Cogia Circle ran Bagdad, Sinbad, Cathay, and Sahib Streets in an east-west direction. Running parallel to Farm Life School Road at the other end of these streets was Mecca Avenue” (Wikipedia). ​Other streets in the city were named Sovereign Boulevard, Aladdin Boulevard, Damascus Street, Cairo Street, Hassan Street, Mustapha Avenue, Bagdad Street, Sinbad Street, Cathay Street, Sahib Street, and Mecca Avenue. When Miami Ghost Chronicles visited the area in November 2016, very little is left of this proposed community 70 years after it closed down. There are a couple of streets that have retained their original names. Only part of the entrance circle is left just west of Farm Life School Road, which in reality is just a grassy area. MGC saw only one house that appears it might have originally been built by Aladdin, but this cannot be confirmed as it appears that it additions made to during the years. A family lives there, and it has a large yard around it that was fenced off. The area is predominantly agricultural and even the houses that are built there are small farms sitting on at least 2 to 3 acres of land.
" People say that this was a mental asylum decades ago that was burned to the ground by one of the patients, eventually killing all staff and inmates. We spoke with Marlene Pardo of the Paranormal Investigators Group Miami Ghost Chronicles who told us, "I participated in a show that was filmed there looking for haunted locations. Towards the end of the filming we had the hostess run out of the place and her camera crew right after her. What's going on there is not in the building itself, but in the woods surrounding it. I would call it the Watcher in the Woods." We'll keep that in mind". The Real Story is: This site was built by the Army in early 1965 in response to the Cuban Missile Crisis and was the facility for the Nike Missile site titled HM-95 D/2/52. These Nike sites were split into two locations. One was the radar communications and control facility, where they did targeting and fire control, and the other was the Launcher area, with the actual missile silos. 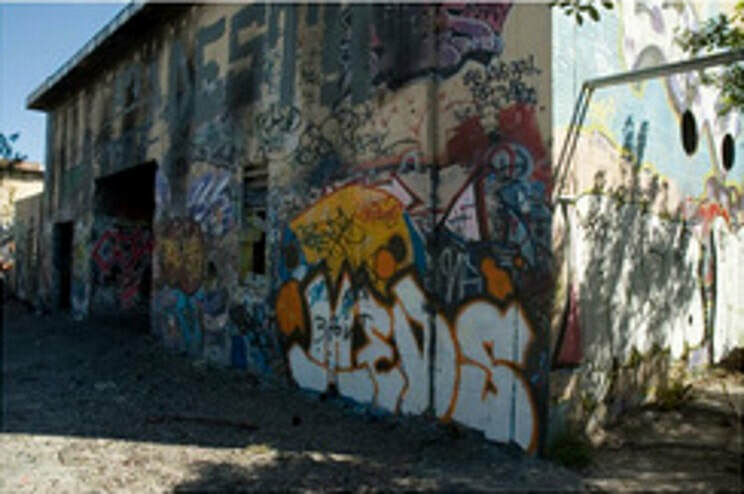 All the Nike Missile sites in South Florida were shut down and decommissioned in June 1979 and the site was most likely abandoned and partially dismantled at that point. In 1980 the site was revived and apparently was used in some capacity during the Mariel Boatlift to house immigrants, but eventually became unused again. It subsequently became a ghostly hangout place that got popular in the early 2000's.